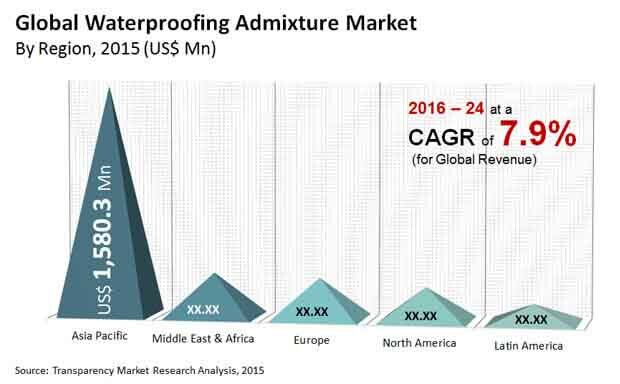 The global waterproofing admixture market is led by a few major players including SIKA AG, Mapei S.p.A, and BASF SE. These associations hold a noteworthy share in the universal market. Noteworthy innovative work and the regressive marketing activities of these organizations have helped to hold the key shares in the market. According to Transparency market Research, it is foreseen that in the years to come, a few global players are gone for creating effective product that is seen to provide better strength by enhancing their water resistance. The global waterproofing admixtures market is estimated to be of worth US$4.9 bn by the end of 2024. The global market is required to extend at CAGR of 7.9% in view of the expansion sought after for solid structures amid the estimate time frame. Based on the product, the global market is segmented into crystalline and pore-blocking. The segment of crystalline is estimated to lead the market through with a share of around 46.7% in the entire market by the end of 2024. Geographically, Asia-Pacific region is ruling the market and is foreseen to sustain the position in future as well. The region is likely to hold 64% of the global share by the 2024. Rising disposable income and surge in ways of life will play a noteworthy factor in driving the global waterproofing admixtures market. Waterproofing admixtures are the admixtures which reduce permeability that oppose water entrance and diminishes absorption into concrete under non-hydrostatic weight or hydrostatic weight. Waterproofing admixtures enhance the toughness of structures and decrease upkeep cost after some time. These factors have surged the demand for waterproofing admixtures in the redesign of old structures and additionally new ones. The fast development of the construction sector in different areas, particularly in nations, for example, China and India has helped the demand for strength and bond, which, as a result is driving waterproofing admixture market. Also, the advancement of new multifamily residential ventures are also anticipated to contribute towards the global demand for waterproofing admixture. Increase in affirmation and understanding the requirement for waterproofing with any sort of structure to protect from degeneration or harm to them is estimated to fuel the development of the market. Exposure with water not just harms the magnificence of the structure or product yet in addition diminishes its strength. Besides, constant drainage or water spillage very heavy on pockets of the individual who has come for the maintenance. So as to stay away from every one of these issues, manufacturers are gesturing for waterproofing admixtures. In the coming years remodeling of old structures will build the demand as well. However, inferable from the authorization of strict government controls on VOC and carbon dioxide transmitting product along with surge in customer awareness about waterproofing admixtures in a couple of regions. Regular waterproofing techniques is estimated going to cause a slowdown in the global waterproofing admixtures market. Customary techniques, for example, box-type waterproofing, bituminous, and lime terracing even now get support from the buyers. Absence of awareness among the consumers regarding the product accessible in the market is foreseen to slug the development of the market. Another observable limitation that is estimated to pull down the market is the staggering expense of the material that the experts envisions in the coming years. This will influence the buyers to settle on the customary technique which is affordable and figures out how to keep water from saturating.